Dubai, UAE, April 09, 2019: As Bentley marks its Centenary year, the Crewe-based luxury car maker celebrates the life of the innovative British engineer whose drive and ingenuity started it all. He earned 25 pence a week for five years training on the job – although it was 18 months before W.O. finally got to work on the steam engines he loved. Later in his life, W.O. recalled: ‘The underside of a car after a few thousand miles is as hygienic as an operating theatre, compared with a locomotive in for overhaul!'. His innovative early years in the automotive industry didn't come without interruption. Commissioned into the Royal Naval Air Service (RNAS) during World War One, W.O. 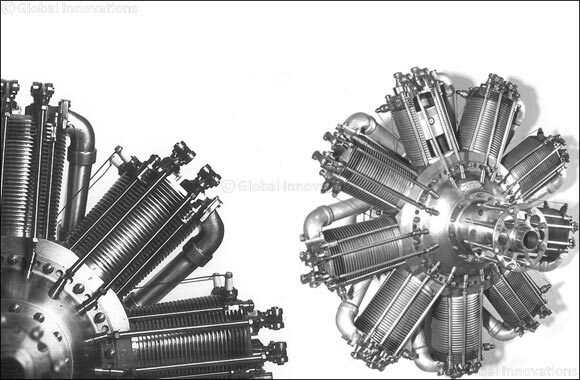 patriotically passed on his lightweight piston idea, which created a more powerful and reliable version of the RNAS's existing aircraft engine. Impressed with his efforts, W.O. 's superiors then allowed him to set about designing a new rotary aircraft engine from scratch. He was afforded every available facility to experiment, instructing engineers at the Humber plant in Coventry, England. The engine was a great success and was soon in mass production for the War effort. The engine was initially known as the Admiralty 1 but later it was decided to honour the name of the founder. The Bentley Rotary 1 subsequently became the BR1 – a fitting tribute to W.O. 's inventiveness. In 1919 W.O. used that capital to fulfil a dream and create his own car company. W.O. built the brand on the guiding principle of creating ‘a fast car, a good car: the best in its class', a goal he would achieve time and time again. Inside each of the 100 limited edition Mulsannes, a slice of the original crankshaft taken from W.O. Bentley's personal 8 Litre car – the last model he designed for Bentley Motors back in 1930 – is displayed. July 10, 2019 marks Bentley's 100th year - an extraordinary milestone achieved by only a few companies. To celebrate the occasion, a year-long series of special activities has been planned, with celebrations at events around the world. These will showcase Bentley's motoring evolution over the last 100 years, highlighting its global success today and the exciting future ahead – all thanks to one man's determination and drive for innovation.